Happy Friday eve! 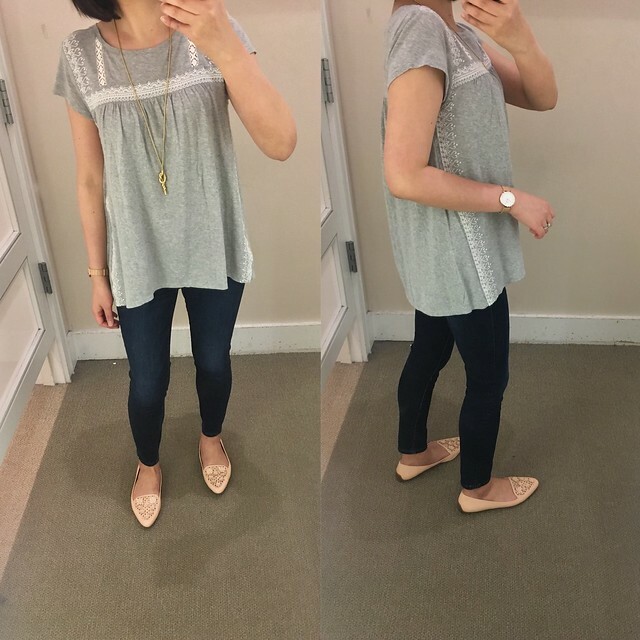 I received this adorable eyelet hem tee (update 6/1: now also available in light blue) when I came back from visiting my folks in PA last weekend. Size XXS was too long on me so I took a chance and dried it on medium heat for 15 minutes since it’s 100% cotton. The striped portion on top shrunk just enough while the eyelet hem appeared to stay the same. This top runs long and has a loose fit in my usual size XXS regular. It’s not offered in petites so if you really want to try it and you’re on the petite side like me (I’m 5’2 1/4″) then I would suggest carefully drying it to assess the fit. Below is a clip of the final outfit before I headed out the door. 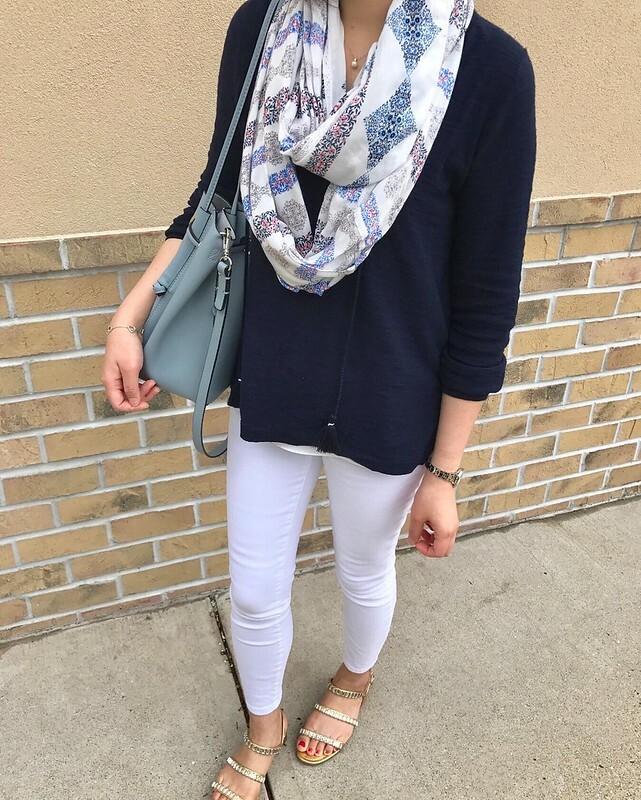 I added this flora infinity scarf since it has a lot of colors that coordinate with many of my outfits, it’s thin making it perfect for spring and it drapes well. Above is another view of the eyelet hem tee (size XXS regular) after I fried it in the dryer for 15 minutes on medium heat. 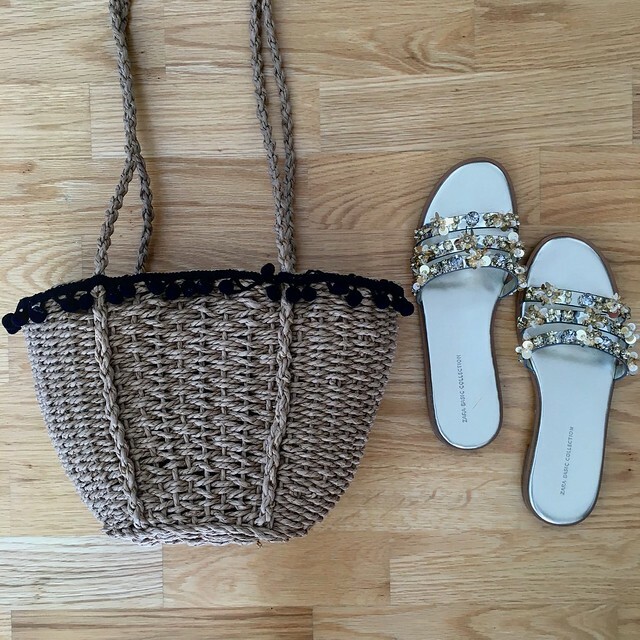 I was wearing the gold slides again today when I noticed that one of the sewn on floral beads was falling off on the second pair I purchased in the next size up. I should have checked all the beads before selecting my pair. However, it looks easy to secure back on and I’m glad it didn’t fall off and get lost while walking around. I love petal sleeve detail on these clean tees and I have them in the striped version and the floral print (as seen in this post). It’s also available in solid colors. The first one I received in the mail was defective but I’m glad I took a chance and reordered it again. Refer to this clip to see how size XXS regular fits me. My mom took the floral one in her usual size large. 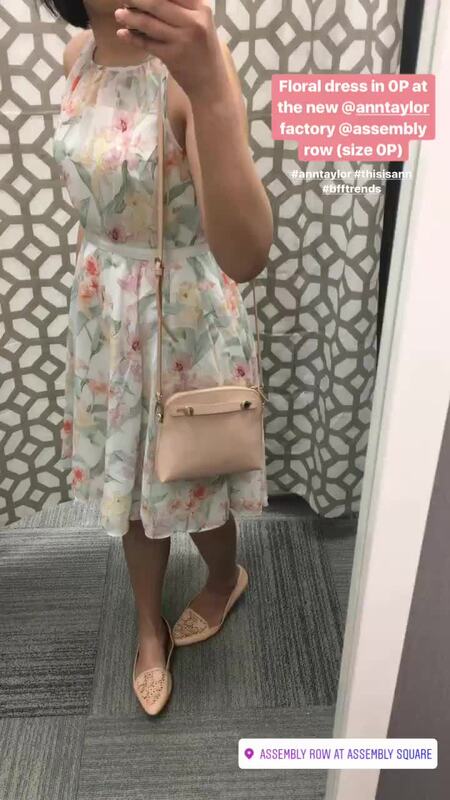 She had picked out a few items she wanted during the last sale and I was happy to see that everything fit her when I brought them down this past weekend. I should have ordered this peony ruffle shell right when it became available online because my size was the first to go. I’ve been stalking it via a bookmark on my phone for a while and I ordered it recently when size XXS popped back in stock online. I usually have a bra gap issue with button ups so my mom helped sew a hidden snap button (as seen in this clip I saved from my Instagram story). 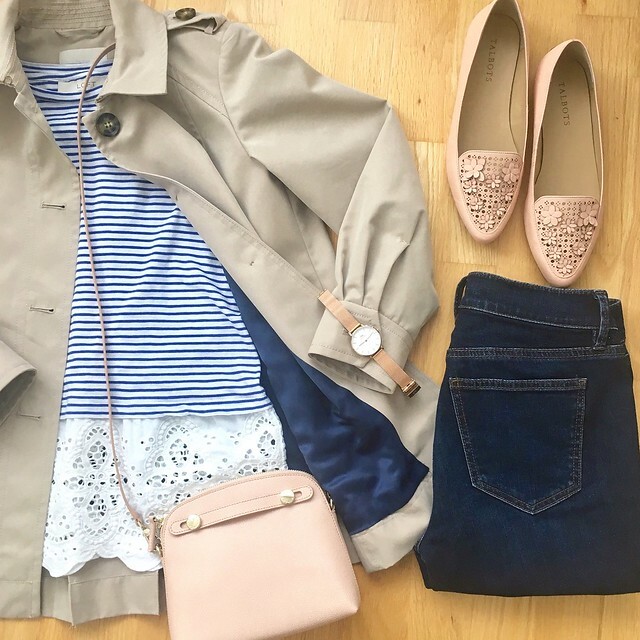 This solution allows me to wear my tops without a layering cami and I have just the right amount of coverage without my bra peeping through the button gap. 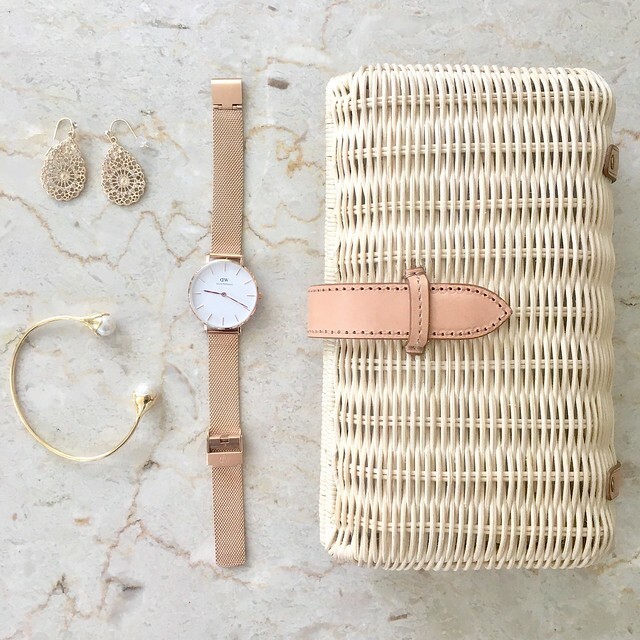 I couldn’t resist getting this popular rattan clutch when it went on sale at J.Crew. I had also checked out the Factory version in store but it didn’t seem as well made and sturdy compared the regular J.Crew version. J.Crew Factory had a few clutches on the floor but all of them had noticeable scratches on the gold/metallic strap likely from excessive handling and the hinges seemed wobbly. I was super excited to learn that Ann Taylor Factory opened a new location at Assembly Row (other store openings to come this summer and fall). 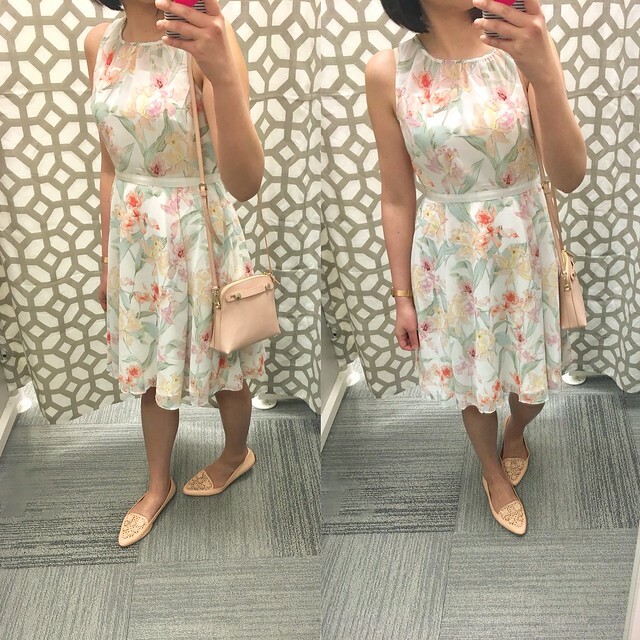 I made an effort to stop by and came across this floral dress which was my favorite new arrival in the petite section. I have nowhere to wear a dress like this and as pretty as it was so I left it behind. I received quite a few compliments via direct message so I figured I’d share it on the blog in case anyone wants to get it for an upcoming wedding or special event. It’s fully lined and fits true to size. I also stopped by LOFT looking for new arrivals but I’d already seen the latest floor set. 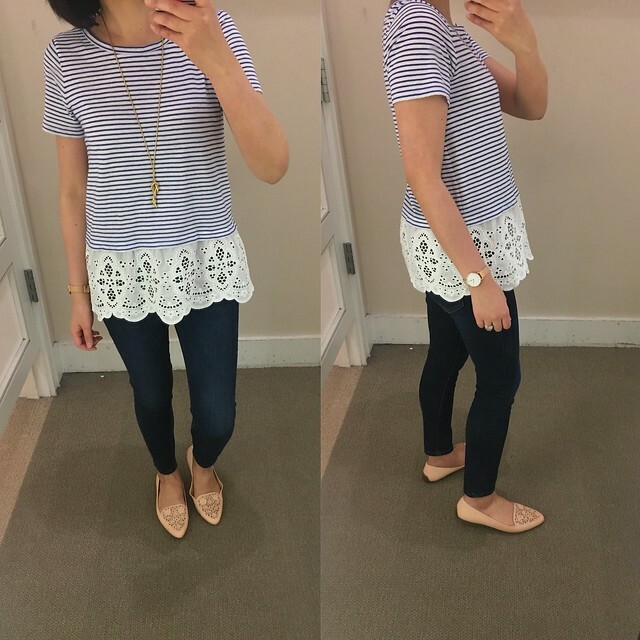 I did find this lace trim tee that I had wanted to order but my size had sold out online due to the flash sale. The one I found in store must have been an online return. 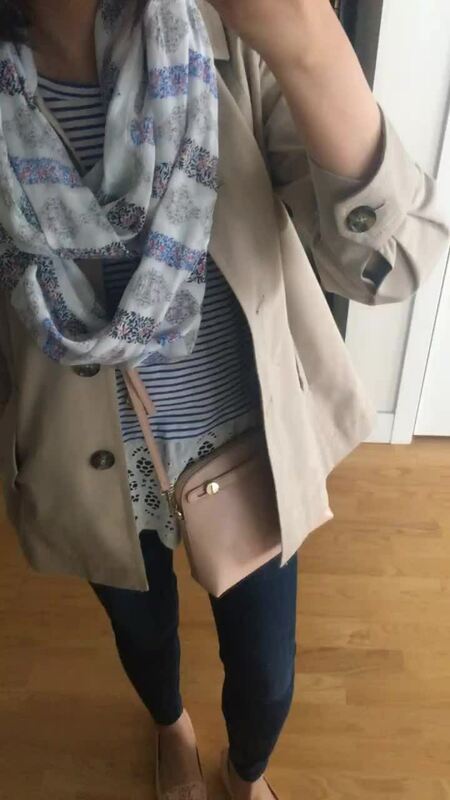 Size XXS regular was loose and long on me but it does drape well despite the extra material. I passed on this top since I would have preferred it if they offered it in petites for a better overall fit. The white embroidery detail is really adorable against the grey material. The petite wooden hangers I ordered last week finally came. The white hangers are painted so they’re smooth on the surface but some of the notches (for keeping straps in place) will need to be smoothed out. I like the rubber grips which prevent the clothes from slipping. I also ordered the petite velvet slim hangers in black and I’ll be swapping out all my mismatched hangers soon. Thanks to Annie @stylishpetite for reviewing and enabling. I’ll try to update my Poshmark (sign up using my referral code HPHAO to get a $5 credit) and/or send in another ThredUp cleanout bag. 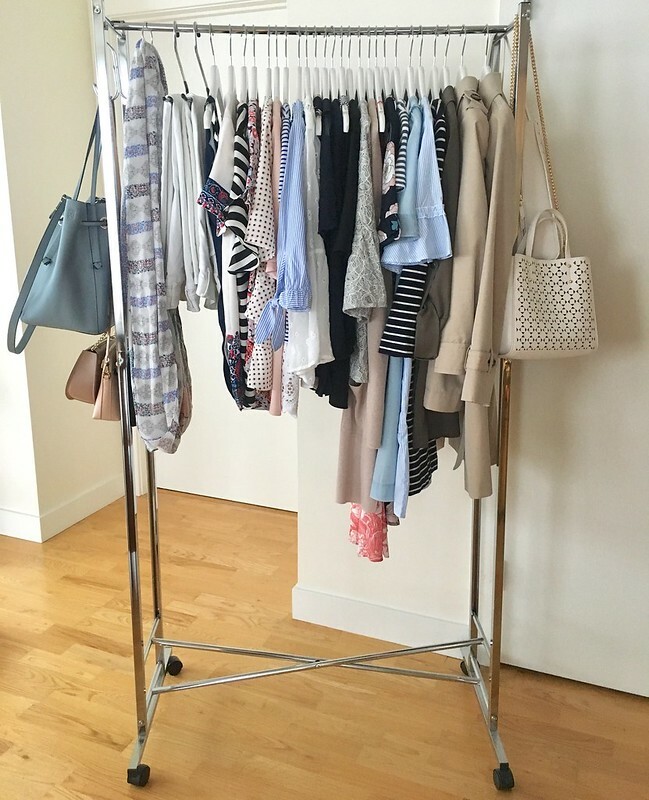 I’ve had this collapsible garment rack for a few years but I’ve been looking for something better. I really like the simple, wooden a-frame clothes rack in Ann Taylor’s recent display windows but I’m not sure where to find something similar.